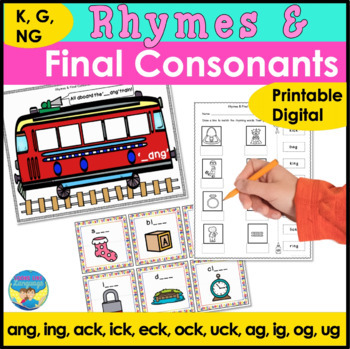 Students will love this speech and language rhyming skills and final consonant set with K, G and NG that has a picture card game, worksheets and sorting activities. The rimes are: ang, ing, ack, ick, eck, ock, uck, ag, ig, og, ug . Some less common words are included to give 6 pictured words for every rime, with the same format to allow differentiated instruction for your mixed groups. 1. 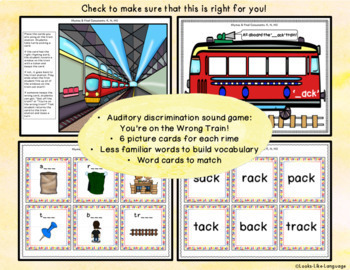 An auditory discrimination game for which pictures belong on the bus. 2. Sorting mats to use with the picture cards. 3. Matching picture cards to word cards. 4. Matching and cut/glue worksheets. 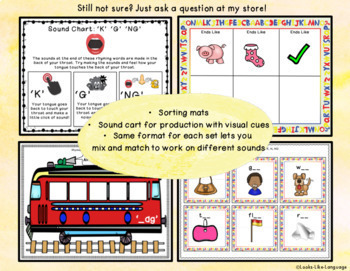 * 11 train game boards for sorting rhymes/saying final consonant sounds. * 66 picture cards for the rhyming words. * 66 word cards for activities. * 11 worksheets to match the pictured rhymes and glue the words. 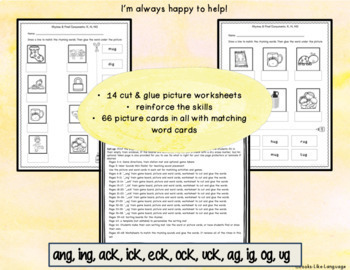 * 3 review worksheets to match rhymes and cut and glue the words. SAVE money $$ with the bundle!